May 2, 2012 brought Mitsuhiko Kawai, CEO of Mistui & Co, to the Newman Library for the 100th Mitsui Lunch Forum. Professor Terrence Martell offered introductory remarks and reflected on the Mitsui lunch forums. It has been an opportunity for students to hear and meet industry leaders. 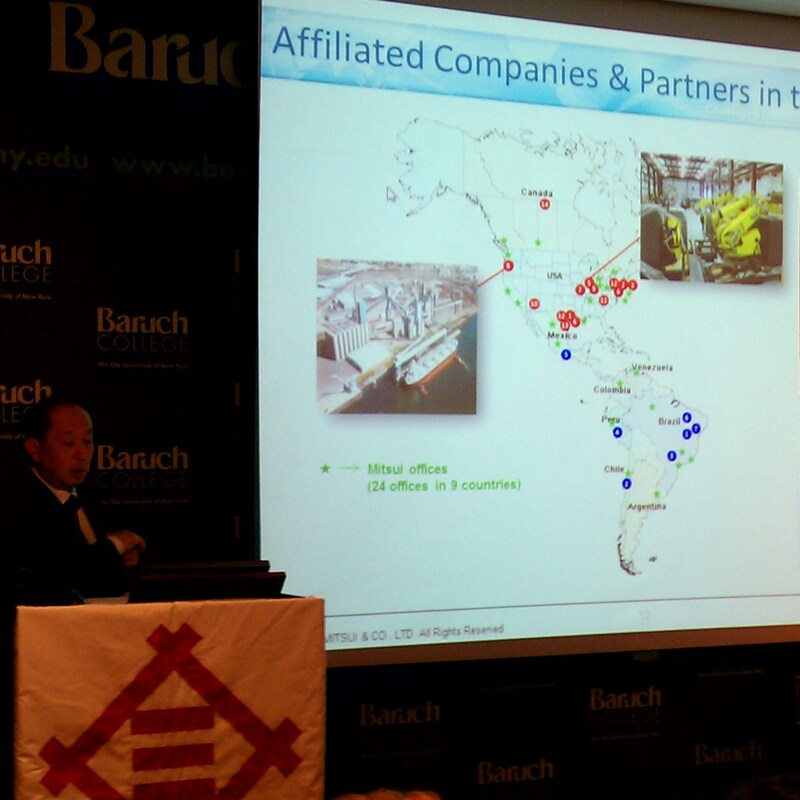 President Mitchell Wallerstein introduced Mitsuhiko Kawai and commented on his career and the role Mitsui has played here at Baruch. 100 is a significant anniversary Mr. Kawai began. In his favorite game, Cricket, the century mark is a high honor. It is an honor too for people and institutions. His own mother lived beyond the century mark on the coast of Japan. A diet of fish probably played a significant role in her longevity. Here at Baruch, sandwiches have spurred the longevity of this forum. He gave a presentation on the origins of the Mitsui & Company. The talk concluded with today’s outlook and strategy. Mitsui, Mr.Kawai explained, traces its roots back many centuries to the trading of rice. It started as a Shosha which loosely translates as a general trading house. It is a model where the company can issue large credit to small manufacturers to purchase commodities and create goods. The 19th century saw Mitsui further integrate to manufacturing and international trading. After WWII GHQ disbanded Mitsui because the company was seen as having a significant contribution to the war effort. The company reorganized in the 50’s with a renewed vigor on importing commodities to Japan — of which Japan has virtually none. Outlook and strategy for the 21st century. Shale gas in the US is driving new thinking about manufacturing in the US. This feed-in material is much less expensive here and thus causes rearranges the calculus. Mitsui like other companies is looking to innovation technologies such as: medical & healthcare; energy management; robotics; and fermentation technologies. At the 200th lunchtime forum what will Mitsui look like? How many executives are non-Japanese? None. The company is not there yet. The transformation from a Japan-centric company to a global one has only just begun. All these years it was centered around importing resources to Japan. It’s only in the 21st century that Mitsui has started to change that focus. What role will the Japanese government play with that transformational role? The Japanese government is dysfunctional. You can break it down to bureaucrats and politicians. They are searching (in their own way) for a new industrialization for Japan. In the meantime, the business world is trying to transform itself and thus is less government reliant. Thank you Mr Kawai for your presentation and for your company’s graciousness. As always many thanks to the staff who made this happen.